It’s not without flaws, but given all that it offers for the price, the presence of beautiful stock Android, and the guarantee of timely updates, the Nexus 9 is worth every penny. Fall is the best time to be an Android fan, and this year is no exception. While Google revealed most aspects of Lollipop in June, the actual update to Android 5.0 is only coming to eager users now, along with three attractive Nexus devices. This year’s Nexus devices are a bit different from the people-pleasers from the last two years. Not only they are more expensive, but the philosophy behind them seems to have changed as well – where Nexus 7 and Nexus 5 democratized access to Google’s vision of Android, the 2014 Nexus 6 and Nexus 9 are unabashed powerhouses that should stand their own against the best devices on the market, without any “for the price” disclaimers snuck in at the end. Big price tags create big expectations, and the Nexus 9 in particular has a high bar to reach – in the tablet market, the iPad still reigns supreme, and the Nexus 9 goes against Apple’s tablet without the benefit of a lower price. The Nexus 9 must also outshine some Android tablets that offer a “good enough” experience at a lower price. While Google itself doesn’t have much at stake, the Nexus 9 is a BIG deal for HTC. This is the first Nexus device made by the embattled Taiwanese company since the Nexus One and the first tablet since the forgettable Flyer, in 2011. HTC’s smartphone business is beginning to stabilize, but the company still needs to diversify into new areas. A successful Nexus tablet could do wonders for HTC, just like it did for Asus, LG, or Samsung in the past. More importantly, the Nexus 9 is a big deal for users. The Nexus 7 (2013) is still perfectly serviceable, but it belongs to the past. It’s close to 18 months old, as well, making the Nexus 9 the way to go if you want a future proof device. But while the Nexus 7 (2013) was almost an impulse buy, buying the HTC Nexus requires more consideration, especially if you choose the higher-end versions. Note that for this review we used the latest software update that Google made available to us, which is supposedly the build that’s running on retail units. With all this said, here’s our in-depth Nexus 9 review. HTC has always been known for their designs and build quality, and this prowess shines through with the Nexus 9 as well. With that said, the device retains the minimalistic design elements of previous Nexus devices. The soft touch plastic back is similar to what was found on the black Nexus 5, so grip isn’t going to be an issue, making the tablet very easy to hold on to. Apart from giving it a more premium look, the metal frame also adds to the rigidity of the device, allowing for a very solid feel in the hand. Despite the bump in dimensions, the Nexus 9 is still quite thin and light for its size, and it shouldn’t get uncomfortable to use for long periods of time. The Nexus 9 may be the most portable device ever, in my opinion the HTC has really nailed it in terms of design and build quality. Of course, this would not be an HTC device without its signature design and hardware elements, the front-facing BoomSound speakers. This speaker setup and placement makes even more sense on a tablet, and sound quality is as good as you would expect from any current HTC smartphone. Even though they’re masked by glass, the speakers are very loud, crisp and clear, and full of depth, and definitely among the best you can find on a tablet. Listening to music, watching videos, and playing games are all that much more enjoyable because of this fantastic audio experience. The HTC Nexus 9 sports a display with a 4:3 aspect ratio, meaning that the screen is “squarer” than on most Android tablets out there, which tend to be 16:9. No aspect ratio is ideal for everyone, so this feature is likely to be divisive. Some users may prefer 4:3 for the extra real estate it affords, which is especially nice for browsing the web and doing productive work in portrait mode. Those who watch a lot of video or play games may like 16:9 better. Talking of video, the Nexus 9 handles the aspect ratio problem by letterboxing 16:9 video – this is not ideal, but for most users it shouldn’t be that big of a deal. On the app front, provided developers do their part, the 4:3 format should be no trouble, as Android apps can easily adapt to a wide variety of screen types. If you’re coming from a Nexus 7 (2013) or a similar device, the 2048 x 1536 (281 ppi) screen of the Nexus 9 will look stunning. The change may be less favorable if you’re coming from a Nexus 10 however, given the Nexus 9’s screen is both smaller and slightly less dense. Still, the device is close enough to the magical 300 ppi threshold to look very crisp at normal viewing distance and even closer. Color reproduction is accurate, viewing angles are great, and the display is very bright. However, I have to deduct some points because sunlight visibility is a bit disappointing. It’s not that I couldn’t use it, but the experience wasn’t that good. On paper and in real life, the Nexus 9 is well equipped in the hardware department, with the only real drawback being the microSD card slot, a feature that Google has shun on all its recent Nexus devices. Being that there’s no 128GB or even 64GB version, that’s something that could turn away some potential buyers. It’s one sacrifice that every Nexus owner must make, and it’s entirely up to you to decide if it’s worth it. Inside the Nexus 9 ticks a dual-core Tegra K1 processor, built on a 64-bit architecture, and while the Nexus 9 isn’t the first 64-bit Android device, it’s the first to run Lollipop, which is designed to take advantage of the architecture. This Nvidia-made processor is especially powerful on the graphics side, where a 192-core Kepler GPU ensures top-notch performance during gaming. 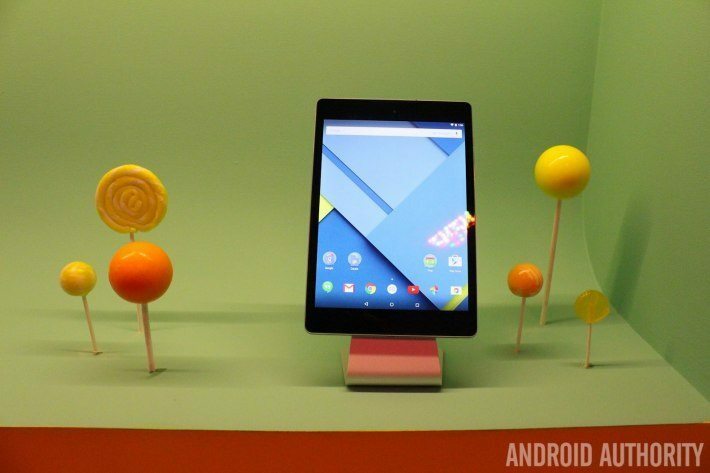 For the most part, the Nexus 9 flies through Lollipop’s smoothly animated interface. But it’s not all the time, which is puzzling. I encountered instances of lag, especially when loading apps, as well as some stuttering when there really shouldn’t be any. Pushing the overview button (recent apps) is particularly jarring, as it sometimes takes 2-3 seconds to load up the screen. I don’t know what the cause of these issues is, but hopefully Google will manage to alleviate them with software updates. The experience is buttery smooth during gaming, and graphics look really good. However, the device heats up noticeably. This also happens when watching a video or just browsing the web for half an hour. The device doesn’t get uncomfortably hot, but it’s still an issue that I hope will be addressed. On paper, the 6,700 mAh battery inside the Nexus 9 should be more than enough to ensure good battery life. However, I was disappointed to find out that, with typical activities like watching YouTube or Netflix and some gaming, the device didn’t last as long as I would’ve hoped. For your reference, I typically got about 4–5 hours of screen-on time, which would be great for a smartphone, but not quite satisfactory for a high-end tablet. It’s possible that the heating issue I mentioned earlier has something to do with the disappointing battery life, and hopefully Google will be able to fix it with an OTA. On the back of the Nexus 9 there’s an 8MP shooter with an LED flash, a significant upgrade over previous Nexus tablet cameras, and a promising setup, at least on paper. Talking about the camera software, you have the stock Google Camera application, and if you’re familiar with this app, you’ll know that the interface is quite simple and minimalistic. There’s not a whole lot you can do in terms of manual controls, so you are dependent on the camera to do all the work. Features like Photosphere, Panorama, and Lens Blur are available though, adding some salt and pepper to an otherwise bland experience. In the past, Nexus devices haven’t necessarily been known for their picture quality, and tablets in general aren’t go-to devices for mobile photography anyways. The Nexus 9 isn’t exactly breaking that mold. Picture quality isn’t particularly bad though, and is better than most other tablet cameras out there, even if that’s not really saying much. Exposure can be hit or miss, but color reproduction does look accurate and true to life, with a good amount of detail. It’s a very decent shooter in a pinch, but once again, it’s not going to replace the far better mobile camera you likely already have in your pocket. With every new Nexus, be it smartphone or tablet, you are also getting the latest version of Android, making the Nexus 9 one of the first devices to feature Android 5.0 Lollipop out of the box. This is the biggest overhaul to Android since Ice Cream Sandwich, bringing with it all the Material Design goodness that we’ve been eagerly looking forward to. With Material Design, everything takes on a flatter look, but there’s a lot more depth, color, and shading, creating an attractive layered look. Animations have been changed as well and make more sense now, with everything coming from somewhere, instead of just popping up. Apps, folders, and various other UI elements slide in and out of view, or grow and expand in a way that is logical, creating a very intuitive experience. Along with Material Design comes a slew of features and enhancements. For starters, the lock screen has been revamped to function as a notification panel, letting you interact with your notifications just like you would when the device is unlocked. With the notification shade, a swipe down from the top reveals all your notifications, with a second swipe down opening up the Quick Settings menu. Heads-up notifications are also a new addition: if you’re doing something in full screen, such as playing a game, notifications will pop up as an overlay, instead of interrupting the app. A new Do Not Disturb mode lets you set what kind of notifications you get and when. This long overdue feature can be really useful at work, during meetings, or if you just don’t want to be bothered. The Recent Apps section has been renamed to Overview, as it not only shows the list of recent applications, but also activities from within the app. Screen pinning is another useful addition, letting you lock the screen to a particular app. Double tap to wake is available as well, and is quite handy when you don’t want fumble for the power button. There are a ton of other features with Android 5.0 Lollipop, and this is definitely the best iteration of Android yet. The Nexus 9 is available right now in three different color options, black, white, and sand, in both 16 GB and 32 GB iterations for $399 and $479 respectively, with an LTE model on the way for close to $600. There you have it – our Nexus 9 review. From the first moments you pick up the Nexus 9, it’s clear that you’re holding Google’s best Nexus tablet yet and a worthy contender to title of best tablet on the market. The Nexus 9 is well-built, features a beautiful screen, great speakers, decent camera, and, above all, offers an exquisite software experience. There are some flaws that I simply can’t ignore – the occasional performance issues are inexcusable and the device heating is an inconvenience you won’t find on other devices. And battery life has been disappointing in my experience. It’s possible that Google, HTC, and Nvidia will find solutions to these problems and a future OTA will erase them, though there’s no guarantee this will happen. With all this considered, I still feel confident to recommend the Nexus 9 as a great buy. Given all that it offers for the price, the presence of beautiful stock Android, and the guarantee of timely updates, the Nexus 9 is worth every penny.